Create the hard candies needed to fill the candy orders. You'll need to design your factory so that the color layers are added to the candies in the correct order. This game combines the challenge of puzzle solving with the action of pinball -- sprinkled with a few ghosts to make things even more interesting! 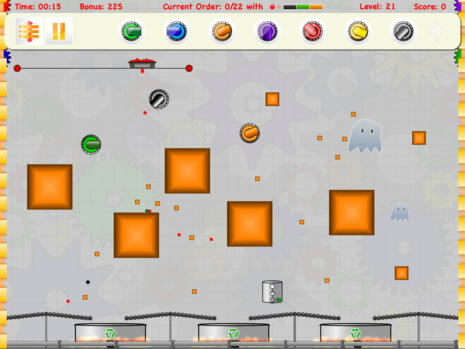 As the levels increase in difficulty, you'll need to think under pressure to align the layer-makers that create the candy colors in the correct order, while protecting your factory from an invasion of pesky ghosts. To add to the excitement, a bonus will be awarded at the end of each level if you can complete the level in time. Rule your iPad by dominating your high scores list! Hard Candy Factory is unique, challenging, fun, and quick to learn using the provided tutorial, tips, and hints. Get it Now! Good luck and Have Fun! iPad, iPhone, iPod touch, and iTunes Music Store are trademarks of Apple Inc. The Bluetooth® word mark and logos are registered trademarks owned by Bluetooth SIG, Inc. and any use of such marks by Apple is under license.